What we describe as visual perception is the ability to interpret visible light that reaches the eye. The result is what we know as sight or vision. When entering the eye the light passes through the Cornea and is refracted – its speed is changed in order to change the direction of its waves. After that it carries on through the Pupil – which size is controlled by the Iris. The aperture in cameras is modelled on the same mechanics and its task is to control the amount of light that passes. Entering through the lens the light is then further refracted and projected as an inverted image onto the retina. Within the retina special synapses interpret the oncoming light into neuronal signals and then conduct so called action potentials to the brain. 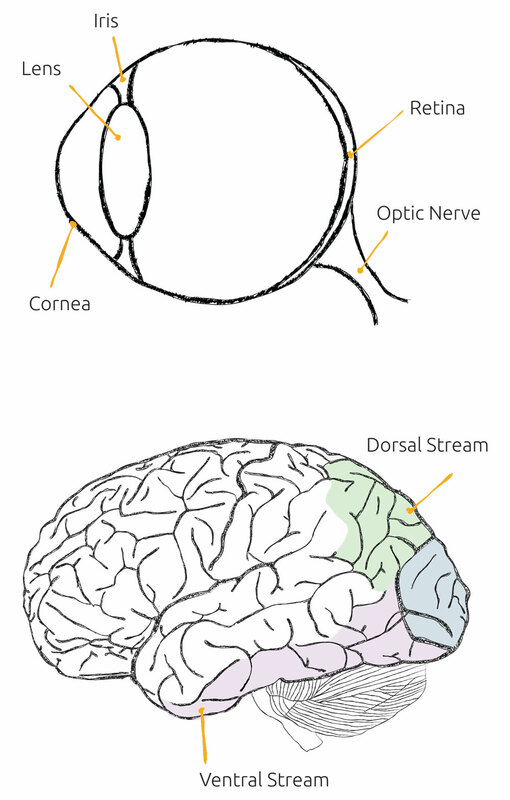 This rough illustration of the brain shows the ‘Ventral Stream’ and the ‘Dorsal Stream’. It also illustrates that large parts of the brain are at work when perceiving visual information.